Powers/Abilities: Within his own realm, Abyss was virtually omnipotent, though he required regular power charges from the Zalkor. He could cast illusions, transform and control others, usurp the power of the Infinity Gems from their users, open dimensional portals, etc. Only a fraction of his abilities were demonstrated. The Zalkor's might faded the farther he ventured from their own reality. (Warlock and the Infinity Watch#31 (fb) - BTS) - Milos Abyss was once a member of a band of scientists, though he had long ago tired of his position and salary as an imperial researcher. Having hear the ancient Zalgodian legend about the Zalkor, bestower of unlimited wishes, Abyss plotted to obtain this power himself, learning everything there was to know about the extinct Zalgodians. (Warlock and the Infinity Watch#31 (fb)) - Abyss was part of an archeological away team sent to examine a newly discovered derelict spacecraft of unknown origin. Only Abyss, with his extensive knowledge of the Zalgodians, was able to decipher the log of the centuries-old ghost ship. Unwilling to share this chance with his co-workers, Abyss slew them all, destroyed the ship, and followed the star chart to the satellite orbiting an unnamed crimson planet. With the Zalgodians long gone, Abyss explored the satellite, eventually encountering the mighty Zalkor. Knowing the Zalkor was addicted to, but unable to reach, the beat-metaphysic Skrimblatt, Abyss transacted the traditional bargain of legend, offering to give it the Skrimblatt in exchange for becoming the Zalkor's Kalorian. Abyss knew that the deal would cost him his soul, but accepted this loss as the Zalkor granted him vast power. Now Count Abyss, he was bonded to the Zalkor and used his new power to conquer his home dimension; world after world fell into submission, galaxy after galaxy paid homage to its new tyrant. Despite or perhaps because of the loss of his soul, Abyss proved to be an exceptionally vicious and merciless despot. (Warlock and the Infinity Watch#29 (fb) - BTS) - Count Abyss came upon Egolix-7, easily conquering it. To legitimize his claim, he took the teenage Maya as his consort. (Warlock and the Infinity Watch#29 (fb) - BTS) - Count Abyss wiped out the resistance movement on Egolix-7, converting the survivors into monstrous servants. (Warlock and the Infinity Watch#29 (fb) - BTS) - Maya served as Abyss' consort for approximately a decade. (Warlock and the Infinity Watch#31 (fb) - BTS) - Though having been content without his soul for several decades, Abyss eventually began to deeply feel the loss of his spirit. With the entire universe conquered, there remained nothing to challenge him, and no satisfaction could be gained from food, woman, drink, or anything else. But crave as he did his lost soul, Abyss could not surrender the power of the Zalkor. Seeking to possess both, he studied for years. (Warlock and the Infinity Watch#31 (fb)) - From an obscure magical tome, Abyss learned of the existence and location of the Infinity Gems, in particular the Soul Gem. (Warlock and the Infinity Watch#31 (fb)) - After three years of searching, Abyss located the Gems amongst the Infinity Watch on Earth. (Warlock and the Infinity Watch#14) - Abyss told Maya of the Gems, and of his particular interest in the Soul Gem. (Warlock and the Infinity Watch#15 - BTS) - Eternity told Adam Warlock that he would soon face a man without a soul. 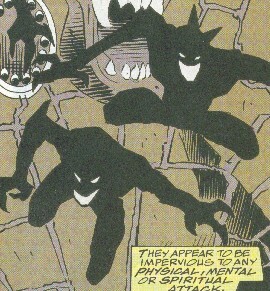 (Warlock and the Infinity Watch#16) - Abyss sent a group of his minions to Monster Island to assault the Infinity Watch. None of the Gems proved to have any effect on the minions, who threatened to overwhelm the Watch, until Adam Warlock correctly reasoned that the minions might be creations of a dead soul; he then used the Soul Gem to expose the minions to the cold light of truth, which proved to be their Achilles heel. After the minions fled back to Abyss, he appeared before the Watch, telling Warlock to give him the Soul Gem or risk his own life. Warlock refused, and Abyss told him that he would suffer for his decision. 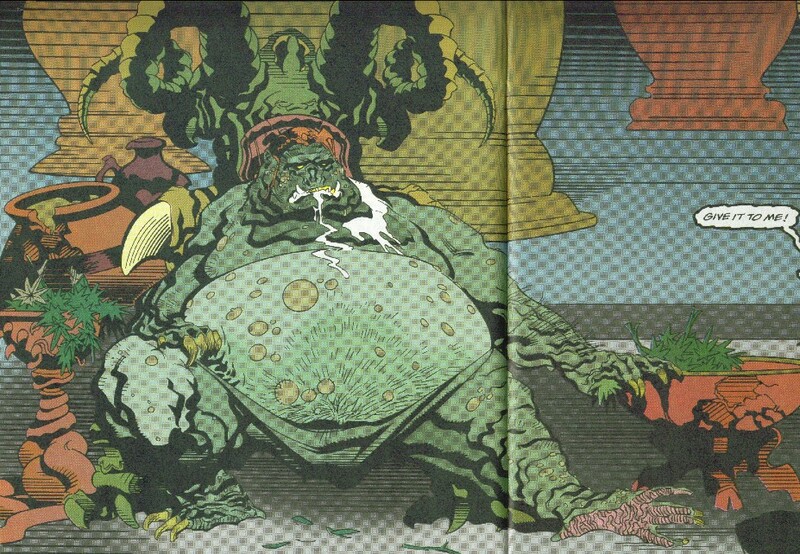 (Warlock and the Infinity Watch#23) - Abyss visited the Zalkor and commanded that he give him what he sought. The Zalkor created a magical love potion for which there was no cure. (Warlock and the Infinity Watch#25) - Abyss bragged to Maya how he would use the love potion to gain the Soul Gem, instructing her that she, too, would take the potion in order to give Warlock a false sense of security. (Warlock and the Infinity Watch#26) - Abyss instructed Maya about the antidote to the love potion she was to take, and he then sent her to Monster Island to institute his plan. However, shortly after her arrival, she was knocked unconscious by Hercules, who along with the rest of the Avengers was under control of the Man-Beast. (Warlock and the Infinity Watch#28) - Abyss was enraged to learn that Maya lay unconscious and had not been able to act out of his instructions as yet. However, she revived soon afterwards. (Warlock and the Infinity Watch#29) - As Maya carried out Abyss' plot, he watched from a distance, amused by the fact that there actually was no antidote. 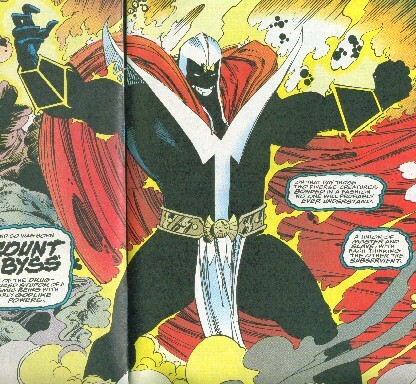 (Warlock and the Infinity Watch#30) - Abyss sent his minions to Monster Island to assault the Infinity Watch and, during the distraction, Abyss himself appeared and abducted Maya back to his fortress. He knew Warlock would be unable to stop himself from traveling to his realm to try to free Maya, and he counted on this fact as his own powers would be superior to those of the Infinity Gems in his realm. (Warlock and the Infinity Watch#31) - Using the Orb of Eternity, Adam Warlock learned of Count Abyss' origins, but incorrectly assumed Abyss intended to bargain Maya's return in exchange for the Soul Gem. Warlock intended to surprise Abyss by confronting him in his own dimension. 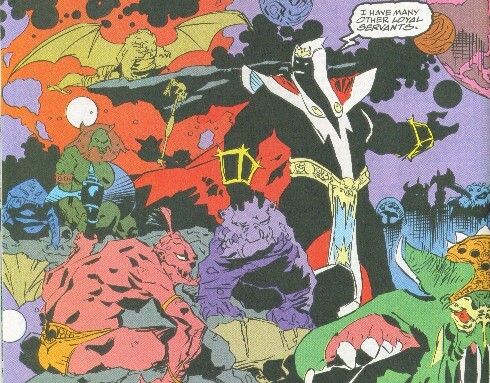 (Warlock and the Infinity Watch#32) - Within Abyss' dimension, Warlock and the Infinity Watch joined forces with Darklore and Meer'lyn. Within the fortress, Maya attempted to kill herself so that Warlock would not risk himself for her, but Abyss easily stopped her. He then returned to the Zalkor, recharging his power so that he would be at his peak. One by one, Abyss overpowered each of the Watch, turning their own Gems' powers against them, as well as Darklore and Meer'ynn. Ultimately, Abyss wrested the Soul Gem from Warlock, intending to use it to know peace at last. (Warlock and the Infinity Watch#33) - Abyss resisted the vampiric influence of the Soul Gem, making himself its master in short order. He briefly drew the residents of Soul World--including Kray-Tor, Autolycus, and likely the Black Knights of the Universal Church of Truth, Borgia, Egeus, Star Thief, and others--out of the Soul Gem, drinking of their souls. While Abyss was somewhat intoxicated from the experience, Meer'lyn retrieved a magical talisman which the heroes used to free themselves. Darklore, Meer'lynn, and Warlock then assaulted Abyss, retrieving the Soul Gem. Abyss smashed Darklore to the ground and attempted to reclaim the Gem, but Warlock transported the soul of Kray-Tor into Abyss. Now possessing the soul of a virtuous man, Abyss was assailed by the agonies of remorse for his many crimes. Abyss transported himself to the Zalkor, hoping to gain further power. However, as Abyss now possessed a soul, the Zalkor failed to recognize him as his Kalorian. Warlock then attacked Abyss, whose soul prevented him from attacking with lethal force. As they struggled, Darklore used his magical talisman to open a portal to another realm many times removed from Abyss and the Zalkor's realm of influence. Warlock retrieved the soul of Kray-Tor, then cast Abyss through the portal, which Darklore swiftly closed. Lacking a source of power, Abyss had no way to return to his home dimension. Darklore restored to normal the people that Abyss had transformed into his monstrous servants, but he could not remove the heartache from Warlock and Maya, nor could he remove the anguish from Kray-Tor, who had been tainted by his brief union with Abyss. Comments: Created by Jim Starlin, Angel Medina, and Bob Almond. I was never really clear whether Egolix-7 was only the name of Maya's kingdom, or if it was the entire realm. Count Abyss has an entry in All-New OHotMU Update#4. Abyss' base, presumably within Egolix-7, it also housed the giant Zalkor in its belly. After Abyss' defeat, it became the castle of Maya and her new consort, Darklore. Natives of Egolix-7 transformed into monstrous forms and forces to serve Abyss. After his defeat, they were restored to normal by Darklore. They assumed a variety of forms; most used only physical assault, though a group were shadowy creatures only able to be harmed by the force of pure truth. An immensely power creature of unknown origin, it granted great power to a single being (its Kalorian), in exchange for that being feeding it the leaves of the beta-metaphysical plant-drug Skrimblatt. The Zalkor itself was addicted to Skrimblatt, but it was essentially immobile and could not feed itself. However, beyond this one limitation, it could apparently grant any ability to its Kalorian, though that being lost his soul in the process. The Zalkor and the Kalorian were bonded in a bizarre union in which both were master and slave. It could not recognize its Kalorian if that being possessed a soul. In the distant past it was worshipped by the Zalgodian race, and it lived aboard an immense satellite orbiting an unnamed red planet. The Zalgodians mysteriously perished, and the Zalkor was left alone for centuries until being found by Abyss, who became its next Kalorian. Abyss transported the Zalkor to the belly of his palace, but after Abyss' banishment, it begged in vain for someone to bring it some Skrimblatt. The Zalkor's might faded the farther he or his agent ventured from their own reality.